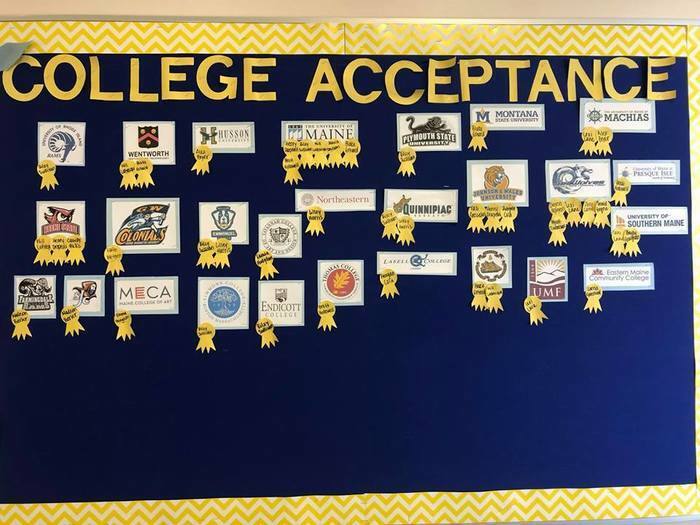 The College Acceptance board is filling up fast! Congratulations to all! Students generated over 130 product ideas for Making and Marketing which started with the new semester. What will the chosen product be? Nine prototypes are being constructed as you see this post...stay tuned! The High School laser cutter in action. Go to the BRHS Facebook page for a video. Students in Mr. Powell's Trig/Precalc class researched and then presented real world examples of trigonometric modeling. Topics included: tides, pulse and blood pressure, engine pistons and sound. Mr. Scott's World History class experiments with Virtual Reality using Google Cardboard VR goggles. Using Google Expeditions, they can tour ancient civilizations and museum exhibits in 3-D. The new 3-D printer has been operating almost non-stop since it arrived. Student projects include this chess set, designed in Rhino by Will LaBrecque. This was part of an assignment in an Independent Study Will has with Mr. Powell. Some impressive artistic and technical skills being developed in Mr. Powell's Engineering class. Here are two examples by Jamie Major (castle) and Lauren Barclay (black and white building). If you know the Rhino drawing program, the intricacy of these drawings will not be lost on you. Incredible detail, layering and shading went into these pieces. Fantastic ladies! Boys Basketball home opener tonight v. Lisbon. JV game at 5:30 with varsity to follow. Happy Holidays from the Boothbay Region High School Library! Any past graduates or community members wanting to enroll in a postsecondary institution can contact Mrs. Johnson for any assistance with the process. Our team is here to help! Email hannah.johnson@aos98schools.org with questions or to set up an appointment. We Never Refuse a Student Lunch! There is a rumor circulating that we won't serve a child lunch if they owe the school money for lunches. That is false! No student is ever denied lunch. We do though expect parents to pay for the meals their children eat. They are not free. Thank you to the Boothbay Harbor Rotary Club for sending us to the United Nations in New York City. Joey Lane, Lexi Lane, and Maddy Barter attended the United Nations last Friday representing our GAPP program along with Frau Merrill. The BRHS mock election results were compiled by senior Faith Blethen. Here is a sampling of the results. Any sophomore that is interested in ordering a class ring but was not at the meeting can pick up a packet in the main office. Can you use the word 'extol' in a sentence? The BRHS Library has started a Word of the Day contest. Students define and use the word in a sentence to be placed in a monthly raffle for a prize. BRHS Parent/Teacher Conferences are scheduled for Monday, November 19th. Please use the link below to sign up. https://goo.gl/forms/Ixv47JJjxoCGKFkT2 Please contact our main office at 207-633-2421 if you need any assistance. A huge thank you to The First National Bank and to The Community Center for the generous donations to our food closet. We are so fortunate for the support of such wonderful community partners! Exciting to see Mr. Gorey's students engaged in mock debates representing Maine's candidates for state and local government. It was a superb way to challenge his students to think critically, practice public speaking skills, and engage in the issues. 21st learning at its best! Nine BRHS students were guests of the Boothbay Region Rotary International. Most of these students were either considering or already students at the VoTech in Bath. The Rotary honored those students for being the next generation of workers in the trades in our state. Rise in Number of Students Nationally Taking the SAT. In 2017, 1.7 million students took the assessment. In 2018, 2.14 million students have taken it. Average score is 531 in math and 536 in writing and reading. Look at Khan Academy if you need help to raise your scores. Congratulations to our boys and girls cross-country teams on both earning Southern Maine's Class C Sportsmanship Awards! Both boys and girls XC teams won the sportsmanship award today. The high school gifted and talented program visited the FARMS kitchen at the CLC Y on Thursday morning. Students prepared, cooked, plated, and ate a meal made from locally grown foods. The goal of team-building and community growth were achieved! Students suggested for their next visit bringing elementary students to grow relationships across the schools. SAVE THE DATE(S)!! BRHS drama students will be presenting their fall production - Into the Woods - November 15th at 7:00pm; November 16th at 7:00pm; and November 17th at 3:00pm and again at 7:00pm. A reminder of the field hockey playoff tonight v. Winthrop. The game is going to be played at Lewiston High School on the turf and begins at 7:00. A reminder, free flu shots for all students on October 18th. Permission slips need to be handed in ahead of time. Forms are in the main office. 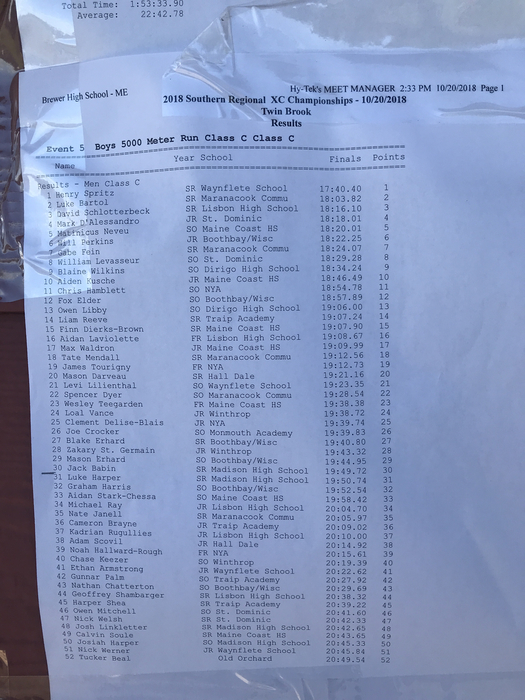 The Boothbay MVC All-Conference XC Runners: 1st Team: Will Perkins, Fox Elder, Graham Harris, Faith Blethen, Glory Blethen. 2nd Team: Grace Campbell. Honorable Mention: Mason Erhard, Ryan Russell, Blake Erhard. Faith Blethen was also named girls runner of the year. Congrats to the girls XC team who were MVC runners up. Faith Blethen won her 3rd individual championship in 4 years and Glory Blethen was the MVC runner up. Free flu clinic for all students on October 18th. Permission forms must be turned in by October 15th. Please call our main office at 207-633-2421 with any questions. Due to tomorrow's forecast we will be cancelling the bonfire and parade. We are working to reschedule. The girls soccer game at Spruce Mountain, originally to be played on October 10th at 3:30, has been rescheduled to October 9th at 4:00 pm. Sports picture day is on October 3rd. Please stop by the main office to get an order form if you have not received one already. The Field Hockey game v. Winthrop tonight has been postponed due to weather. A reminder of the girls soccer game tonight at home v. Lisbon, 3:30 start, and the home football game v. Sacopee Valley at 7:00. Both girls soccer at Hall-Dale and the field hockey game at Dirigo are still being played. The girls soccer bus will leave between 2:15 and 2:30 (as soon as a bus returns from the afternoon run), which will delay the start of the game. BRHS Open House tomorrow night. Free spaghetti dinner at 5:30 in the cafeteria. We hope to see you there! Project Graduation meeting tonight at 5:15. Girls soccer at Wiscasset on 9/19 is a 7:00 p.m. start. Reminder: Financial Aid Night with our Guidance Department at 5:30 tomorrow night. 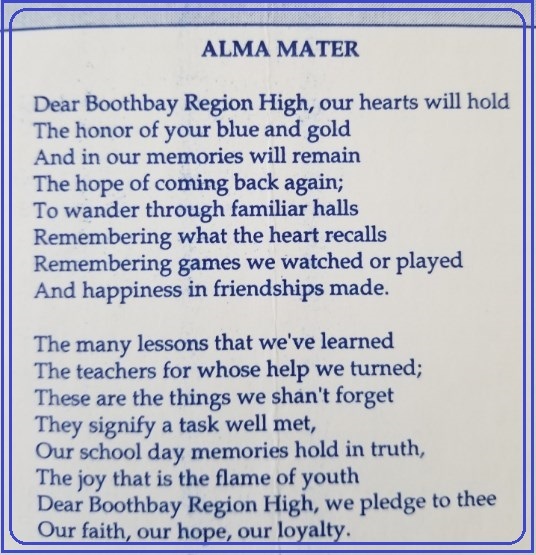 Boothbay Region High School Open House Thursday, September 27th. A free dinner for students, parents, and teachers at 5:30. Come have a meal and meet our outstanding faculty. Congratulations to Lilley Harris for being named a National Merit Semi-Finalist! Correction... Senior Financial Aid Nights is Thursday, September 18th at 5:30 in the library. Thursday, October 11th is our FAFSA filing lab. Parents will be receiving a packet in the mail soon. There will be a Project Graduation meeting on Wednesday, September 12th at 5:15 in the high school auditorium. Members of the class of 2019 and their parents are encouraged to attend. AP Results are in and 64% of BRHS exams scored a 3 or higher! This is above State and National Results. Congratulations to our outstanding teachers and students! BRHS Students - Hopefully, everyone is taking advantage of their FREE memberships at the YMCA courtesy of a generous benefactor. As a famous advertisement says: GO FOR IT!